doctored photo, but its reflection on the table remained. 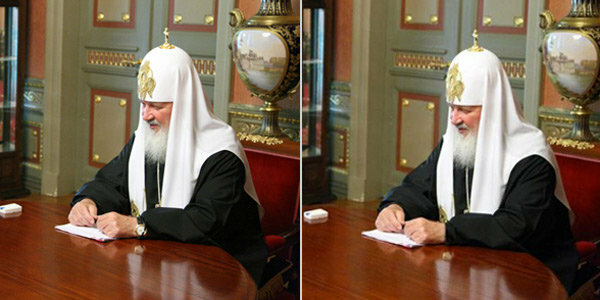 The story of Patriarch Kirill I and his $30,000 watch was fodder for a New York Times article. The retention of Greg Mortenson, author of Three Cups of Tea, as a staffer and ex officio board member of the Central Asia Institute was also written about in the Times. Finally, the story of Michael Harrington's recusal refusal was carried on NH Public Radio. I have three different reactions to these stories. The first story, of course, is one of extremely bad taste. I don't much like the helmet or the vase or gilded doorway, either. What is notable in the story is that the Patriarch endorsed the re-election of Vladimir Putin. The second story is sad. Mortenson, despite Jon Krakauer's continued sniping, has done a lot of good things with his life. This is a story, unlike the first, that raises deep questions about forgiveness and the role of our justice system. It also raises questions about nonprofit structure and management. Mr. Krakauer continues to be right on the facts, but one wonders if he has a board in his own eye. An increase in the number of board members for CAI sounds like a prudent decision and Montana Attorney General Bullock seems to have handled things well. The last story is horrifying. As a former employee of the New Hampshire Public Utilities Commission, I am dismayed that Commissioner Amy Ignatius added her signature to an order that closed the door for further procedural objections to Commissioner Harrington's recusal. What is more disturbing is that Mike thought it appropriate for his signature to be on this order! How much benefit does one need to accrue before the law is obeyed? Who developed the standard of “a sufficient appearance of partiality to merit disqualification”? Some very good further analysis of this decision can be found on REAL's website. I agree that this makes a mockery of the process and does not build the confidence of the public.